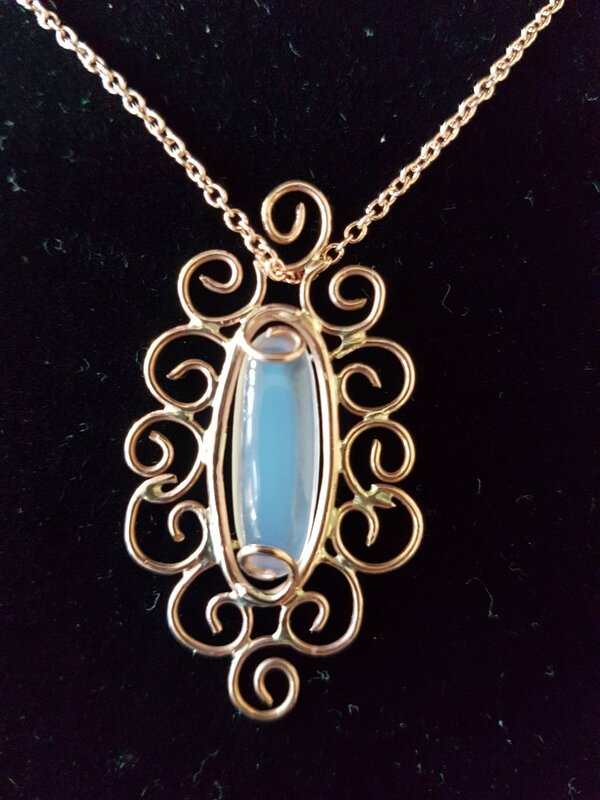 Michelle originally trained as a biochemist and worked for many years in cancer research at St Vincent’s Hospital and UNSW, and has been hand crafting jewellery for over 15 years. A deep appreciation of the science of jewellery design is combined with a desire for original artistic experience, and a respect for the synergy of these components is at the centre of the design and manufacturing processes. Michelle held her first exhibition at the ‘Gaffa’ Gallery in Clarence Street, Sydney in 2010. Since 2012, she has exhibited pieces at the Lavender Bay Gallery of the Royal Art Society of NSW and was an invited stall holder at the inaugural Artisan’s Market held at the ‘Coal Loader’, Waverton, in 2013. Michelle was a student for several years at Studio 303, Leichardt, learning metal smithing and other techniques with artisan goldsmith and jeweller, Ernst Pfenninger. She also exhibited pieces in the adjoining gallery and has since been commissioned to make necklaces, earrings, bangles, cufflinks and rings. Michelle completed courses in Jewellery Design and Gem Setting at the Gemmological Association of Australia (GAA), and combined her passion for science and jewellery by graduating with her Diploma of Gemmology (Distinction) in 2012. Since then, Michelle has served on the Executive Management Committee of the GAA as NSW Vice President of Education, and continues to write and edit the NSW Newsletter. She is a Lecturer and Head Demonstrator at the GAA, and is frequently involved in the revision and writing of course notes and assessment material. Gemmology is at the interface of the art and science. This informs each of Michelle’s pieces and the beautiful gemstones that she sources from around the world. The physical workability of precious metals provides the scaffold to hold, protect and embellish intrinsically valuable material as well as adding obvious value. The jewellery is simultaneously functional, enduring and individual. Each piece is original and considered in its design, and hand crafted to create a special piece of wearable art. 2017 all rights reserved Ku-ring-gai Artists Trail.